These are binding Terms of Service and rules for advertising that apply to ZooBurza.eu (the General conditions), which comes to force by their disclosure. By using the services of ZooBurza.eu you accept the General conditions from that point onwards. Usage of the services of this portal is subject to the unconditional consent of the user to these General Conditions. 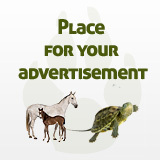 Advertisement portal ZooBurza.eu is designed for publication of notices of intended purposes in form of private and business advertising, on premise of accepting the General conditions. If the portal owner does not state otherwise, the use of services of the portal ZooBurza.eu is free. Registration of advertisers is voluntary, however it is recommended as it unveils more options in administration of the ads. It is mandatory to include valid email address for both registered and unregistered advertisers or other details, that are not understood as personal details according to Law of NR SR n. 122/2013 Z.z. about protection of personal details, which are essential in order to organize the ad into relevant category. Owner of the advertising portal ZooBurza.eu reserves the right to remove ads that are in the contradiction to laws of Slovak republic, morality or are otherwise unfit for publication. Furthermore the owner reserves the right to restrict or prevent access to users who violate these terms. Ads can only be added to relevant categories corresponding with their content. If the ad is eligible for inclusion in several categories, it can be included only in one of them - the one that captures its nature best. Advertiser is allowed to post any number of various ads. Each ad may be published just once. Duplicate ads with identical content will be removed without notice. The owner reserves the rights to restrict the number of ads allowed to be published in particular category. It is not allowed to add the title, or otherwise advertise services of identical content as are provided by ZooBurza.eu. Ads violating this rule will be removed with no further notice. Filled ad is added to the ad portal ZooBurza.eu immediately after submitting the ad (with exception to paid services). In the text of an ad a user can attach (promote) any form of contact (including web address), whilst the only mandatory contact is a valid email. The owner or his designee (the operator) reserves the right to remove any ad without the further notice. Which based on its content was not added to appropriate category or is in contrary to laws of Slovak republic, morality, or if the operator deems it necessary. The user agrees to use ZooBurza.eu on his own risk. In case of violation of laws, the operator provides cooperation and all the available data about the user to legitimate authorities. Unless otherwise specified, the operator has no obligation to the user. The operator does not guarantee uninterrupted functionality of ZooBurza.eu, its flawless operation and security. The operator also reserves the right to shut down the ad portal ZooBurza.eu without any further notice and reason. The operator is not liable for any damage caused to the user by use of the portal ZooBurza.eu or its malfunction, flaws in security, activities of other users or other reasons. The operator bears no responsibility for the content of advertising portal ZooBurza.eu and ads that were added by users either legally or illegally and neither bears the responsibility in case of misuse of services by users or third party. The operator reserves the right to use the information (contact information, etc.) published on his ad portal on his sole discretion. Owner of the portal hold no liability in terms of origin, quality, delivery, withdrawal, payment and usability of offered exhibits. We reserve the right to change conditions of the advertising at any time. This provision also applies to information about paid services. In the event of a change in prices of paid services, this change will not affect the already submitted and paid for services, those will be published throughout the period for which they were paid according to the original price list. The operator has the right to decide on matter of termination of the add portal ZooBurza.eu at any time. User agrees to these terms and rules of advertising and signs the approval mark shown underneath citing - "I agree with the general conditions of advertising." These conditions were published on 2 August 2016.